On Thursday it was publication day and I travelled to London to have lunch with my agent, Yasmin, editor, Eleanor, and publicist, Sophia. They'd booked a table at the Paternoster Chophouse which is the restaurant where Channel Four's First Dates is filmed. I love First Dates, so was a bit disappointed to discover that Fred doesn't actually work there, but it is a lovely place and surpringly different to how it looks on TV (apart from the sofa's at the entrance). 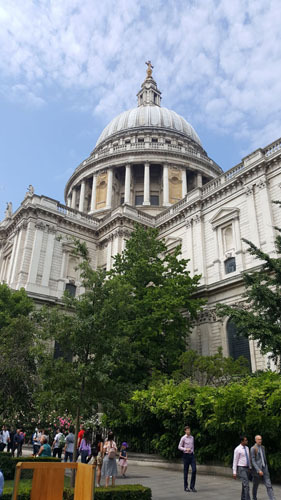 It's a really beautiful part of London, sitting in a pedestrianised square just outside the grounds of St Paul's cathedral. It was great to catch up with the wonderful team who have been so passionate about my book, I'm very lucky to have found such dedicated people. Their enthusiasm is totally uplifting. I left not quite wanting the day to end so took a long walk, enjoyed the sunshine, then managed to stay awake on the train home by reading the messages and reviews that had come in throughout the day. The Definition of Us is out now! After much anticipation publication day felt a bit surreal. My author copies hadn't arrived and so I had no physical copy to hold in my hands but I was getting messages saying it had been spotted early in a few branches of Waterstones. On Wednesday I finally cracked and headed off to town to see if I could find a copy myself. Lo and behold there was in a little pile on a table in Waterstones Cambridge! I had to buy one, of course. I have always bought a copy of my book when it's come out, even though I get sent a nice pile from my publisher. I never say who I am (too shy) and I just enjoy being the customer and seeing it sitting there looking for all the world like a regular book in a regular shop (I never get over how great this is!). 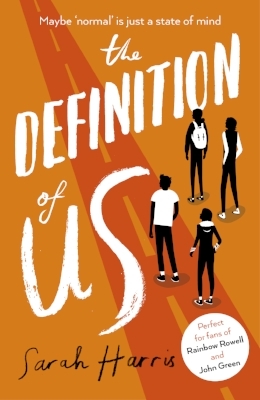 I am so excited to finally reveal the cover for my new book, The Definition of Us! The cover was created by designer, Nathan Burton for Little, Brown - thank you Nathan! It's really striking and I love how he's captured Florence, Andrew, Jasper and Wilf - particularly Florence's Converse and Andrew's backpack (adorable)!